Ask fellow campers about "Page's Resort and Marina" and nearby attractions. Question: This resort and marina is actually on Gabriola Island, not Nanaimo, is it not? Answer: Yes, you take a 20-25 minute ferry from downtown Nanaimo to Gabriola Island. Then it’s a 10 minute drive along either North or South Rd to the other end of the Island. Very friendly owners. 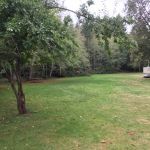 Campground is a meadow in a forested area 100 yards from the ocean and marina. 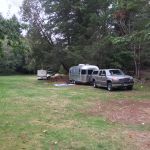 There are secluded tenting sites as well as an open area that can accommodate small groups and RV's up to 26 feet. RV's over 26 feet may have difficulty accessing the campground because of tight turns to enter the camping meadow. Be prepared to level your RV because you'll be parking on grass. The meadow runs east west so you can find a shady spot under the trees to the south or more sun on the north side of the meadow. There are 4 duplex 110 volt 15 amp plugs in one spot. You'll need a converter plug to 15A. The camping fee is $20 Canadian and for $6 more you can have electricity. The plug ins are all in one spot so be sure to arrange a spot close by, and have a heavy gauge cord, to avoid voltage losses over long power cords runs. Complimentary high speed wireless Internet, weak in the picnic grounds but strong in reception area. Local cell signal is 2-3 bars out of 5. Washrooms with coin operated hot showers ($2 for 3 mins - water is precious on the island) and coin op laundry room Picnic tables On site kayak, scooter and mountain bike rentals Store selling ice, ice cream & snacks, select groceries, pharmaceutical items, fishing bait and clothing Tents, tent trailers, small campers & RV's are welcome. Pets on leash and picked up after are welcome. We camped at Page's Resort and Marina in a Travel Trailer. If you are in an RV phone ahead and explain what your needs are re powers etc. Are you affiliated with Page's Resort and Marina ?